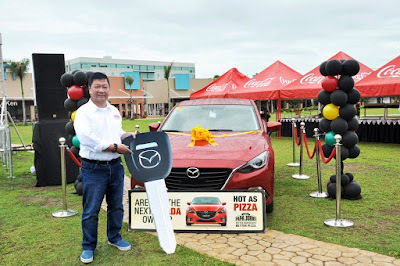 In celebration of its 5th year of making better pizzas in the Philippines, world-famous pizza restaurant chain Papa John’s has successfully wrapped up its first-ever Mazda 3 Grand Car Raffle Promo via a fun family day event last June 21 at Blue Bay Walk, Metropolitan Avenue Bay Area in Pasay City. The luckiest among all customers who joined and now the proud owner of a brand new Mazda 3 Hatchback is Vibien N. Estrada of Sampaloc, Manila. Her name was officially drawn by Paul Soo, Berjaya Philippines Head amid much cheering from the crowd. DTI representative Ernesto Gajo, Jr. was also present to validate the winning raffle entry. Mr. Soo said the recent car promo affirmed Papa John’s commitment and gratitude to loyal patrons since the US-leading pizza chain brand opened its doors in the Philippines in 2010. “When we thought about the promo, we want to do something that can give back to the people that helped us grow the brand and the business, for their loyalty and continued patronage to Papa John’s. 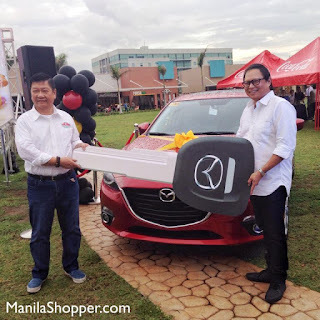 Since we are on our fifth year, we decided to have a grand car raffle promo and what better car to give away than Mazda which is a very successful, reliable brand as well,” Soo said. In addition to the grand raffle draw, the festive event came loaded with surprise giveaways which were raffled off to guests’ delight, like an overnight stay for two at Berjaya Hotel in Makati and gift certificates. Guests were also treated to a day of pizza indulgence and festivities, like interactive booths, street magic, and a highlight event called the Pizza Eating Contest where parents and their children took on the challenge of finishing off the most number of pizza slices in 60 seconds. Two pairs were hailed the ultimate pizza eating champions and were awarded with gift certificates from Nestle and Papa John’s Pizza. Via a store-wide promo that ran from January to June, the Mazda 3 Hatchback Grand Raffle Promo attracted close to thousands of entries. During the promo period, customers who made a minimum P500 purchase were given the chance to win a sleek Mazda 3 Hatchback. Vibien Estrada’s entry came from Papa John’s Manila Plaza, Ever Recto outlet. To date, Papa John’s has 18 branches with newest outlets in Concepcion Uno in Marikina, Circumferential Road in Antipolo, and Aurora Blvd. in Cubao, Quezon City. Apart from the just concluded Mazda car promo, Papa John’s will be coming up with an assortment of special deals and other in-store promotions to tie into the anniversary year. “We are very happy with the success of the promo. Hopefully, more people will come and get to know and love what Papa John’s can offer in terms of the superior quality of ingredients and homemade freshness of our food products,” Mr. Soo added. Mr. Soo is also proud to say that Papa John’s, being one of the leading and continuously growing pizza chain brands in the US, has also been steadily gaining stronger market presence in the metro and in nearby city and provincial sites edit amid fierce competition. “We are currently doing well in the Philippines, and we’ll keep growing here. We are confident in making Papa John’ more known by exploring more potential store locations in Manila. As for products, Papa John’s fans can expect more quality and better tasting pizza variants, as well as more convenient delivery services and enjoyable dining conveniences from us in the months to come,” he concluded. For more updates, “like” Papa John's Philippines on Facebook or follow Papa John's Philippines on Twitter.